Yesterday we had some friends over to watch the penultimate stage of the Tour de France and we all enjoyed a delicious brunch. 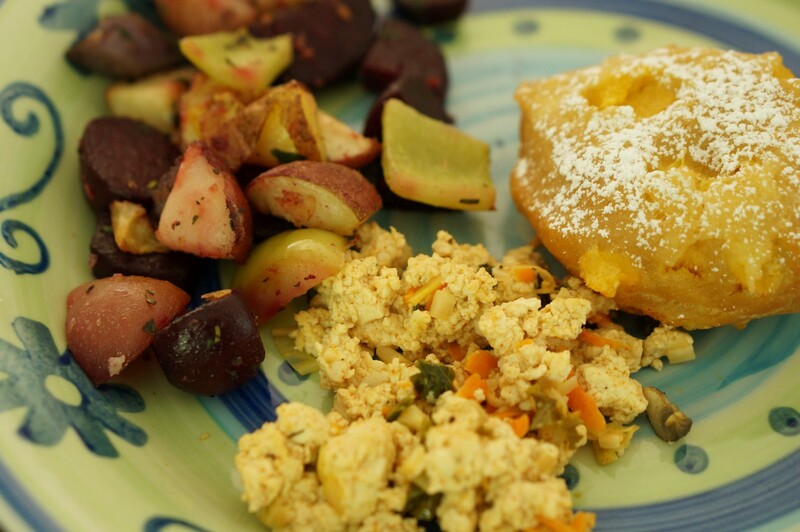 The tofu scramble and roasted vegetables were good but what really came out well were the peach beignets. Credit to Darlene for coming up with that idea. I’m not sure how authentic they were but they sure did taste good. I ended up using my tried and true recipe for Apple Uglies but instead of apples and cinnamon I used some nice local peaches we’ve been getting from our CSA. 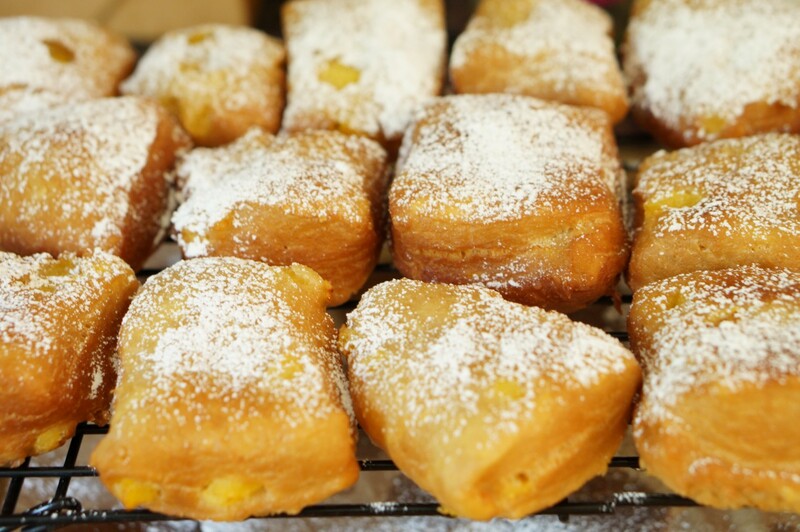 I cut back on the sugar a little too since the beignets got a generous dusting of powdered sugar at the end. The main modification to the recipe that I needed was to add a lot of extra flour since the peaches were so juicy. And rather than making each piece of dough into an oblong shape I rolled out the dough and cut it into squares beignet-style. I posted my basic tofu scramble recipe a long time ago on our previous blog and this one was similar. Instead of onion I used a leek from our CSA and I also added a shredded carrot, mushrooms and kale. The roasted veggies were all from the CSA – red potatoes, purple potatoes, beets and bell peppers. These were coated with olive oil, salt and some fresh herbs from our garden (thyme, oregano, rosemary and lavender) and roasted in a 400 degree oven for about 40 minutes. All agreed it was an excellent meal!